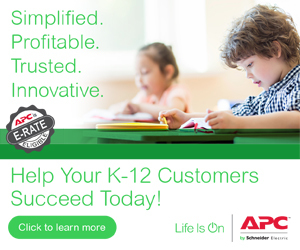 Last year APC by Schneider Electric launched the Back-UPS Connect family of uninterruptible power supplies (UPS), our first to specifically address the requirements of the network in the small office/home office (SOHO) environment. Now we’re rolling out a new Back-UPS Connect model that includes new features partners should be able to tout to their SMB customers – or even larger companies with some smaller locations. When it comes to SOHO locations, it’s not so much computers that customers want to back up, because most use laptops or even tablets already have internal batteries. What they need to protect is the network connection that gives those devices access to the Internet and all online resources, including critical cloud-based applications. 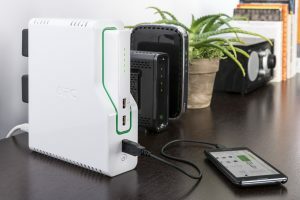 The Back-UPS Connect family is intended to provide power for the network router or cable modem that supplies the Internet connection. These devices typically don’t draw much power – maybe 10 watts or so. Our new model, the BGE50ML, will power network devices for about 2.5 hours in the case of a power outage, often enough to tide users over until the power comes back. What’s more, it’s easily removable, which enables some innovative features. What’s more, li-ion batteries also last longer than lead acid batteries, thus needing to be serviced less frequently. They’re more environmentally friendly, too – an important feature for the many companies looking to become more green. For one, users can take the battery out of the UPS and use it to charge devices while they’re on the go – a boon for heavy mobile users who constantly face availability problems due to the slim internal batteries on their devices. The feature also partners an opportunity to encourage customers to buy additional batteries so they don’t have to choose between powering the network during an outage and charging their mobile devices on the go. Of course the extra battery can also be used to provide extra runtime for the network when used with the Back-UPS unit. The battery, which is a little larger than a deck of playing cards, has two USB ports. One of the ports puts out 1 amp of power while the other is 2.4 amps, great for charging smart phones and tablets, respectively. A third USB port is built directly into the UPS chassis. The new model features a number of installation options. It can stand upright, lay flat, or even attach to a wall. And its two outlets both swivel to make it easier to connect plugs, even when they have bulky transformers. The Back-UPS Connect BGE50ML gives partners another way to open discussions with customers about the need to back up their network connections – and gain some additional benefits in the process. Click here to go to the product page and learn more.